KaBlackout animal trophy head templates enable you to create your own faux taxidermy wall decorations in any colour scheme you like. Once you have stuck together your trophy head the next step is to mount the papercraft on your wall for display. Here are some suggestions on how to hang your trophy head. Hanging a trophy head on a nail or screw. If there is already a nail or screw protruding from the wall, it is very straight forward. The backplate on our trophy heads is designed with an opening to let you reach inside the trophy. Simply lift the trophy facing outwards to the wall, put the hole over the nail and gently slide the trophy downwards until the top edge of the backplate catches on the nail. Carefully let go and if it seems secure the job is done! If you’re made the papercraft from cardstock of about 210 gsm weight it should be light enough for even small nails to cope with. 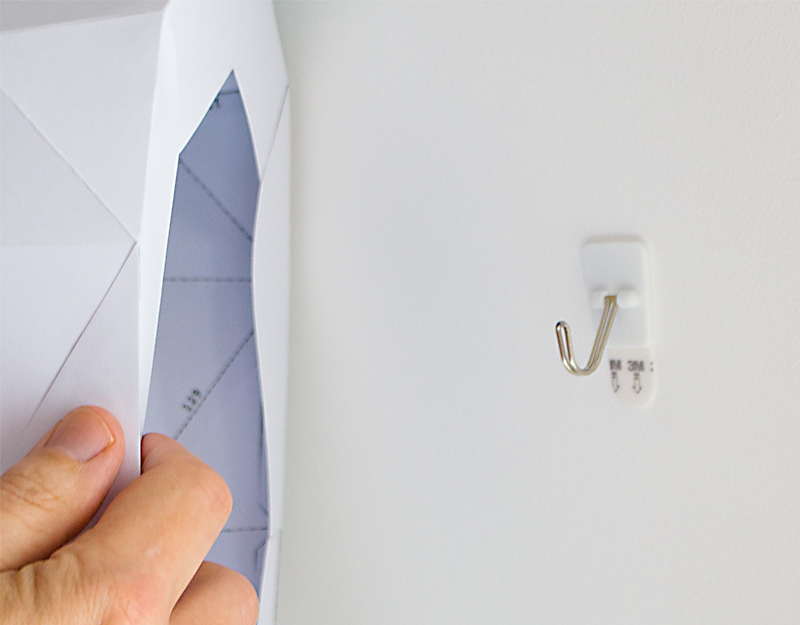 This handy removable hook is perfect for supporting your papercraft trophy head. If there is no handy nail already there, you can pick exactly where you think your trophy will make the most impact and carefully hammer a small nail into the wall at the right location. 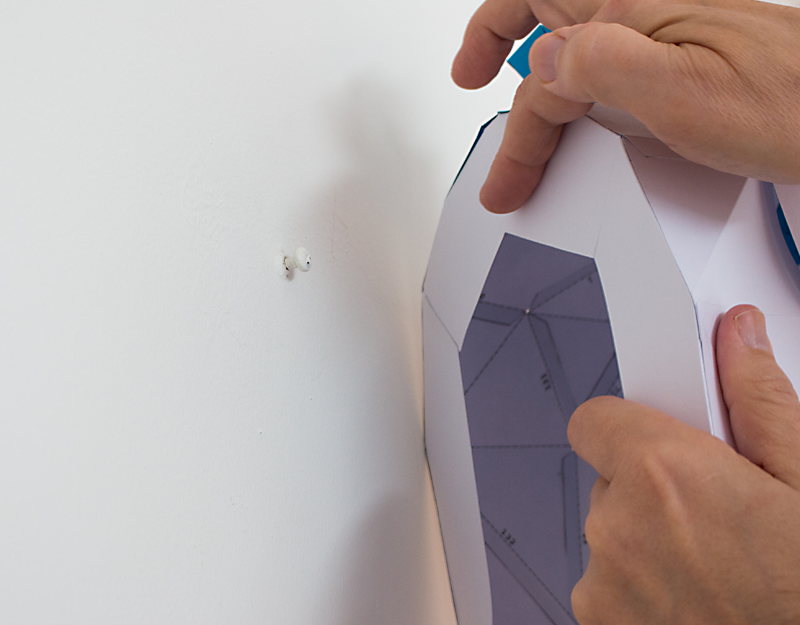 Alternately if you don’t want to permanently mark the wall you can attach a self-adhesive hook to your wall. Packs of these hooks can be bought in hardware and DIY stores, and some are specifically designed to be easy to remove without marking the wall. You might think I’m overlooking gluedots as an obvious method to hang your paper trophy but actually I don’t find them very useful for this. This is because it is very difficult to press the trophy firmly enough against the wall for the glue dots to adhere properly without simultaneously crushing the trophy. Velcro tape is perfect to allow you to adjust the unicorn legs to the correct position. Our Galloping Unicorn template lets you build the trophy head and the unicorn’s forelegs. All three parts of this sculpture must be hung on a wall for a dynamic display. You can hang the head as I have suggested above, but positioning the legs is harder because you’ll need some freedom to adjust their position until the ensemble looks just right. We solve this by using self-adhesive Velcro tape. Stick some small patches of Velcro on the backplate on each leg, and a larger patch or strip of the “opposite” Velcro on the wall in roughly the right place. 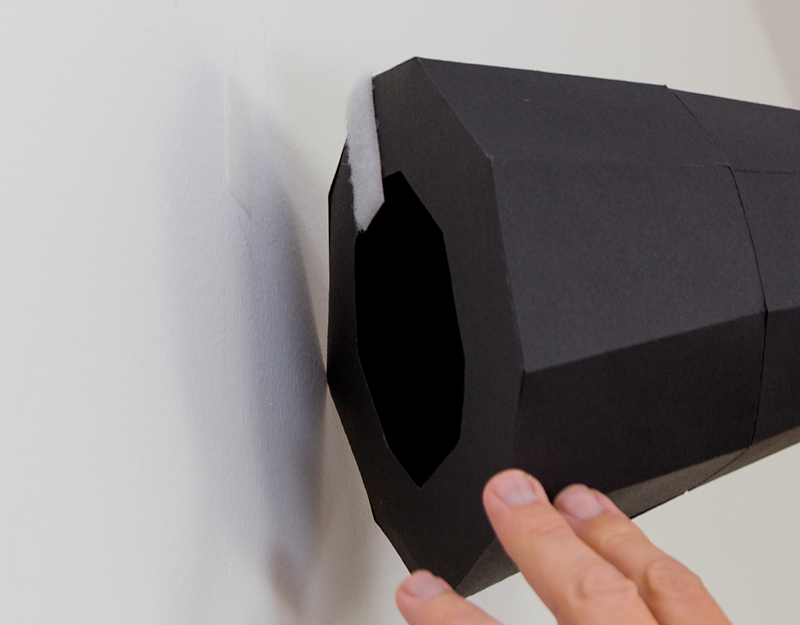 The piece stuck to the wall shouldn’t be too big; you want it to be covered entirely by the leg. Then you can try placing each leg where you think it should go, it will hang perfectly from the Velcro, but if you’re not sure it is in the right place you can carefully peel the leg off and reposition it until you are satisfied. 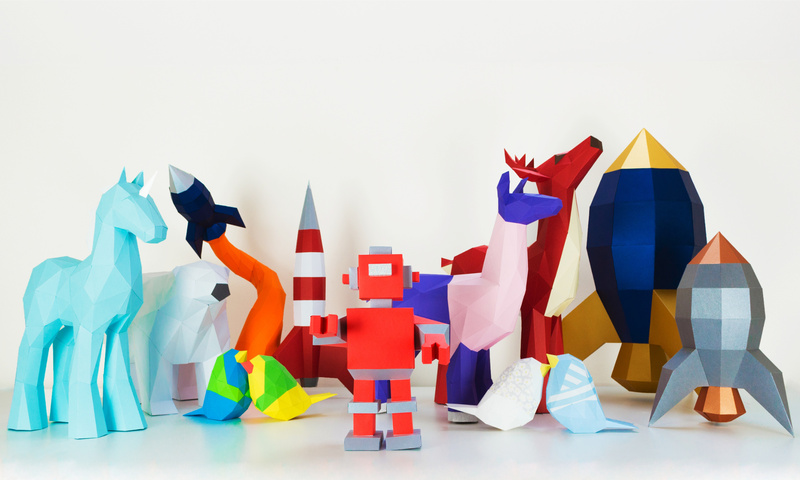 Next PostNext Papercraft Templates: Ingenious and Alternative Ways To Use Them!